McNaughton described himself as a big fan of the National Football League (NFL) before NFL players such as former San Francisco 49ers quarterback Colin Kaepernick kneeled during the national anthem to protest racial inequality. “It’s more than a banner, it represents all the people that have sacrificed, that have died and spilled their blood for this country, and so that’s why it’s so offensive,” McNaughton said. 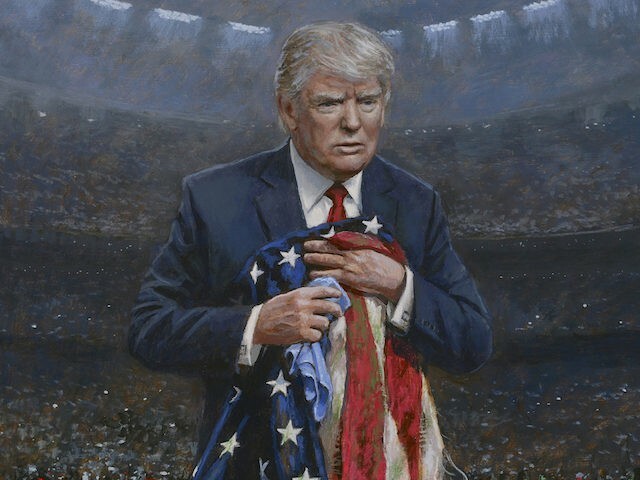 McNaughton’s work has prompted mixed reactions from people depending on whether they sided with the president or the NFL players. McNaughton, who despite receiving icy reviews on the painting from some major art critics, is getting a lot of demand for his work. He said he had received hundreds of orders for both lithographs and more expensive limited edition canvas prints since the painting’s release.